Lexus of Richmond’s week 18 nominee for the Leadership Award Scholarship is Calie Rehme of Powhatan High School. Having a 4.3762 GPA, she is ranked 8th out of 340 students. She is a member of the National Honor Society, the National English Honor Society, and the Computer Science Honor Society. She has been on the All A Honor Roll since 2015. In 2016 Calie was selected as the AP Environmental Student of the Year. Calie was awarded the West Point Leadership Award in 2018. While attending Powhatan, Calie has been involved in numerous student groups and activities outside the classroom. She is the President and Founder of the Foreign Language Club. The members of this club will teach foreign language classes to local elementary students after school to help spark their interest in a particular language or culture at an early age. Calie is the Founder and Host of the Annual Powhatan Warrior Run where all proceeds are donated to The Wounded Warrior Project. Additionally she has Founded the Powhatan Warrior Scholarship for PHS students applying for a ROTC program, enlisting in the military, or applying to a US service academy. Calie is the treasurer for the Computer Science Honor Society. She is a Peer Ambassador for the school and a member of the Fellowship of Christian Athletes. Calie founded the Monday Mindset at Powhatan which is a weekly morning announcement from members of the National Honor Society, where the members will share encouraging or meaningful quotes. Throughout her time in high school Calie has been a member of the Varsity Field Hockey team since her freshman year, playing as a midfielder. As a sophomore she was named to the 2nd Team All District and 2nd Team All Region. Following her junior season Calie was selected for the 1st Team All District and the 2nd Team All Region. In 2018 as a senior she was recognized as 1st Team All District and 1st Team All Region, and Calie was chosen for the Richmond Times Dispatch First Team All-Metro. Calie has also been a part of Powhatan’s Varsity Basketball team and the Varsity Indoor Track and Field teams. Since 2017 Calie has been a part of the River City Crew. She rows as part of a Women’s Varsity 4 boat. She and her teammates qualified for the Regionals in 2017 and 2018. Ever present and active in her community, Calie is no stranger to volunteering her time for service projects. Calie has participated with Backpacks of Love since 2014. She is involved with the Caritas and with Feedmore. Calie has been on mission trips with Powhatan Community Church. Both in 2015, she was a coach for the Richmond Volleyball Club U11 team and an assistant coach for a YMCA Basketball team. Since 2015 Calie has been a counselor at the Trinity Basketball Camp. She additionally constructs blankets for the Children’s Hospital at Virginia Commonwealth University Hospital. Calie has won a dinner for two and is now in the running for the $10,000 scholarship. 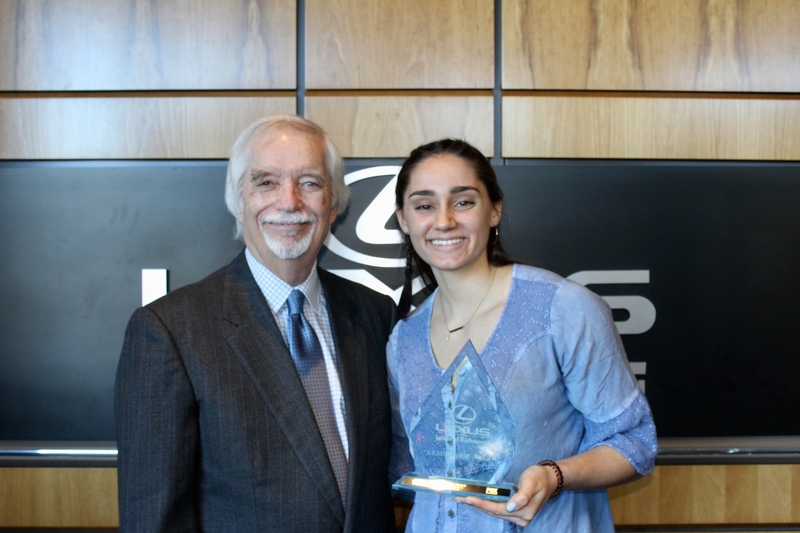 Watch the Fox Richmond – WRLH interview and the Lexus of Richmond Leadership Award interview to learn more about Calie! Remember to check Facebook for more information about each weekly nominee throughout the school year! 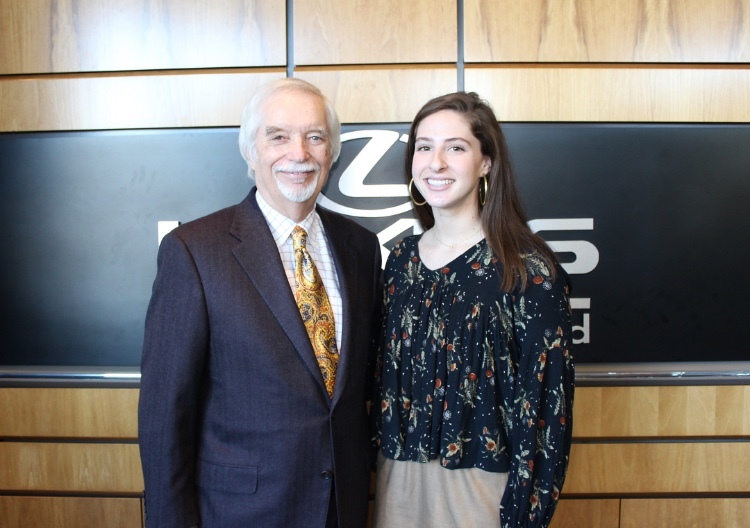 Lexus of Richmond’s week 16 Lexus Leadership Award scholarship nominee is Emily Callahan of Maggie Walker Governor’s School. Emily is a member of the National Honor Society with a current 4.27 GPA. Additionally Emily is a member of the National English Honor Society, the German National Honor Society, and the Thomas Jefferson History Honor Society. She earned 3 perfect scores on her AP exams, and Emily scored a 33 out of 36 on the ACT exam. In 2017 Emily received a Silver Award for her efforts on the National Spanish Exam. She attended the American Legion Auxiliary Virginia Girls’ State in 2018. Emily has received a National Merit Scholar Commendation. Outside of the classroom, Emily involved in several organizations. She has been a member of Maggie Walker’s Spanish Club since freshman year, and she is a two year member of the German Club. Emily is involved in her school’s Knitting Club and the Baking Club. She is a member of the Dead Theologians’ Society. Emily began her Girl Scout career at only 4 years old. She is still an active member today having earned her Silver Award. Emily is working towards the Gold Award, the highest award or honor a Girl Scout can receive. While attending Maggie Walker, Emily has been a member of the field hockey team all four years as a goalkeeper. Freshman year she played on the JV team, and she has been on Varsity since sophomore year. In 2018 as a senior she was selected to be a captain for the team. During her final season the team made it to the State Semi-Finals. Emily was selected for the 2nd Team All Region. As a freshman Emily was on both the indoor and outdoor track team where she threw shootout and discuss. Outside of her school athletic career, Emily has played for the Undertow Field Hockey Club since 2015. In 2018 she joined both the Blackhawks Indoor Lacrosse team and the Salle Green Fencing team. Through her involvement in the Girl Scouts, Emily has been involved in numerous service projects including: litter removal, state park beautification, Global Youth Service Day, etc. She also founded a Girl Scouts Brownie Troop in 2017. She has volunteered for the SPCA Summer Camp in 2015. Beginning in 2018 Emily spends time with the US Equine Rescue League. In 2018 she was a volunteer coach for the Blackhawks Youth Lacrosse team. Emily is a regular contributor to the Miles of Scarves organization. Miles of Scarves then sells her work to raise money for those affected by Multiple Sclerosis. Emily has been a Church Acolyte since 4th grade, and during the summer of 2017 Emily volunteered for the Catholic Heart Workcamp. Emily has won a dinner for two and is now in the running for the $10,000 scholarship. Watch the Fox Richmond – WRLH interview and the Lexus of Richmond Leadership Award interview to learn more about Emily! Remember to check Facebook for more information about each weekly nominee throughout the school year! 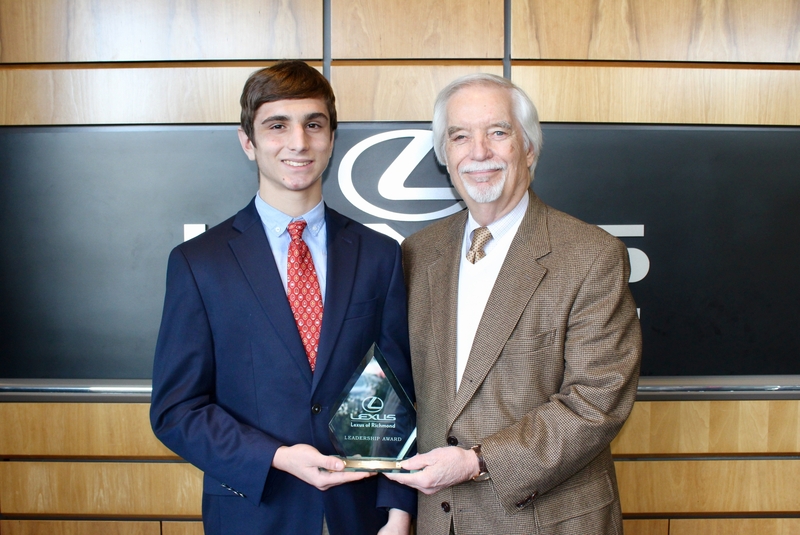 Lexus of Richmond’s week 15 nominee for the Leadership Award Scholarship is Philip Maruri of St. Christopher’s School. As a freshman and sophomore, Philip had the highest GPA of his class; with a current 4.7 GPA, Philip is ranked in the top 2 of the class. He scored a 1540 out of 1600 on the SAT exam and a 780 out of 800 on the SAT II for Spanish. Philip is an AP Scholar with Distinction having received 5 perfect scores on AP exams. In 2017 Philip received both the Excellence in Spanish Award and the Excellence in British Literature Award from St. Christopher’s. He received the George Squires Literary Award for Best Traditional Form Poetry in 2018. Philip was presented with the Jefferson Book Award and the Bausch and Lomb Science Award, both in 2018. He is also a 2018 National Hispanic Recognition Program Finalist and a 2018 National Merit Commended Scholar. In 2017 Philip attended the Yale Young Global Scholars summer program Frontiers of Math and Science. In 2018 Philip was chosen to attend the Virginia Summer Governor’s School of Agriculture. While a junior at St. Chris, Philip helped found the Saints For Environmental Awareness and Action. He revamped a deficit environmental club with a new name and purpose, and he has served as the co-head for two years. Philip is a three year member of the Battle of the Brains team at St. Chris and currently a co-captain. He is in the Political Awareness Club where he serves as the Vice President. He is a tenor in the group Beaux Ties, an acapella group at St. Christopher’s. Phillip participates in the school glee club and the school literary magazine, the Hieroglyphic. A two sport athlete throughout high school, Philip is a 4 year member of both the Varsity Cross Country team and the Varsity Wrestling team. In 2017 and 2018 the cross country team won the Prep League Championship and the Division 1 State Championship. While on the wrestling team, Philip was a 106 freshman and sophomore starter. During his first and second season the team was the Prep League Champions and the VISAA runner up. As a sophomore Philip finish with a winning record. For his junior year Philip moved up to the 126 weight class. He placed 6th at the Blue Devil Classic and 4th at the Battle at Dinwiddie. The team took 1st place at the Prep Slam in Atlanta. They were the Prep League Champions and the VISAA State Champions last season. Being a member of the Boy Scouts of America since 7th grade, Philip is now officially an Eagle Scout. For his Eagle Scout project, Philip renovated a garden at the Hermitage retirement home. He designed and constructed new wheelchair accessible flower beds over the course of 135 hours. With the SEAA Club he has helped with multiple river clean ups each year at Belle Isle. Philip traveled to Patagonia and to Costa Rica for school service trips. As a St. Chris Peer Advisor Philip helps guide freshman through the first year of high school. He is additionally a 4 year member (current captain) of St. ChristoCURES which raises money and awareness for the Massey Cancer Center. Philip has won a dinner for two and is now in the running for the $10,000 scholarship. 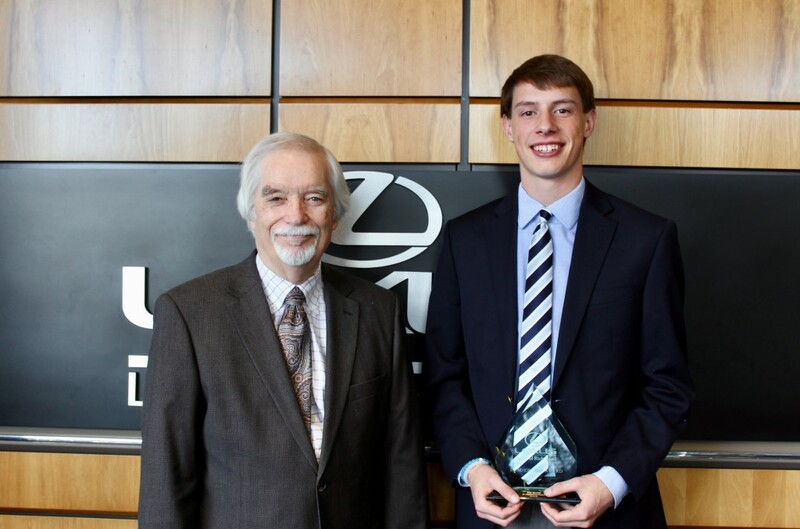 Watch the Fox Richmond – WRLH interview and the Lexus of Richmond Leadership Award interview to learn more about Philip! Remember to check Facebook for more information about each weekly nominee throughout the school year! 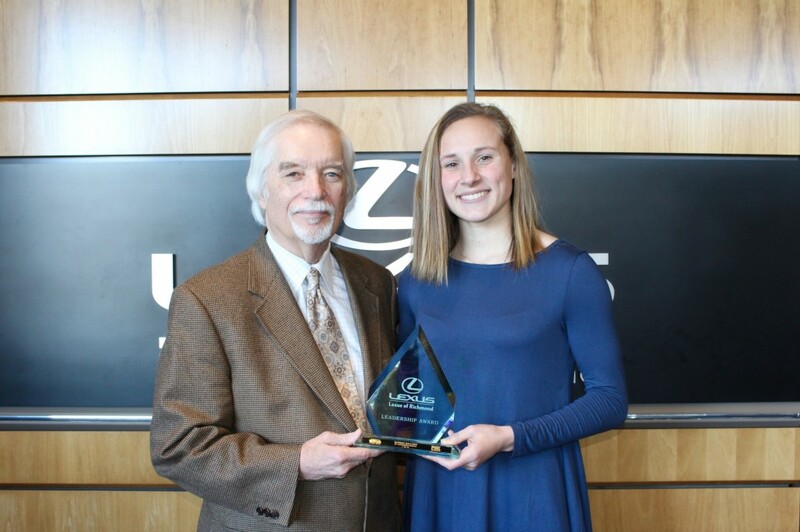 Lexus of Richmond presents Maggie Salomonsky of Powhatan High School as our week 13 Leadership Award Scholarship Nominee. With a 4.4095 GPA Maggie is currently ranked in the top 4 of her graduating class. She is a member of the National English Honor Society and the National Computer Science Honor Society. In 2018 Maggie received the William and Mary Leadership Award. She took 2nd place for public speaking at the Future Business Leaders of America Regional Conference. Maggie was a Delegate of Virginia at the Congress of Future Science and Technology Leaders. Maggie has won a dinner for two and is now in the running for the $10,000 scholarship. 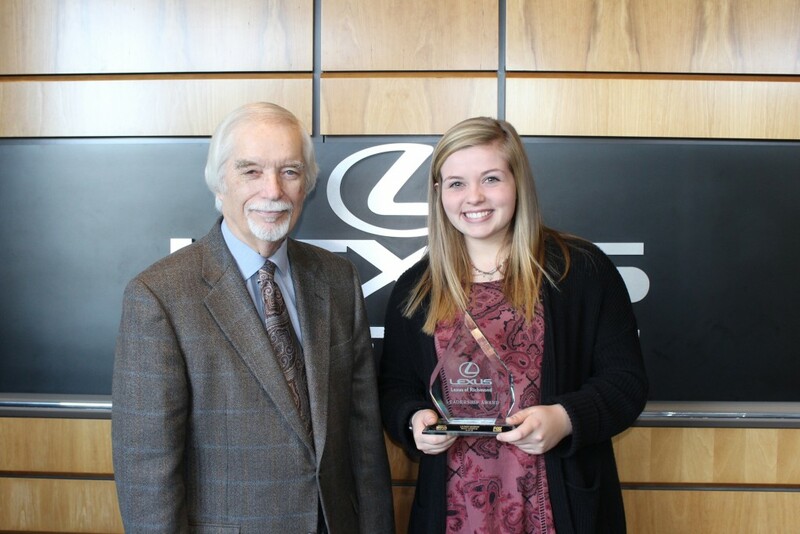 Watch the Fox Richmond – WRLH interview and the Lexus of Richmond Leadership Award interview to learn more about Maggie! Remember to check Facebook for more information about each weekly nominee throughout the school year! 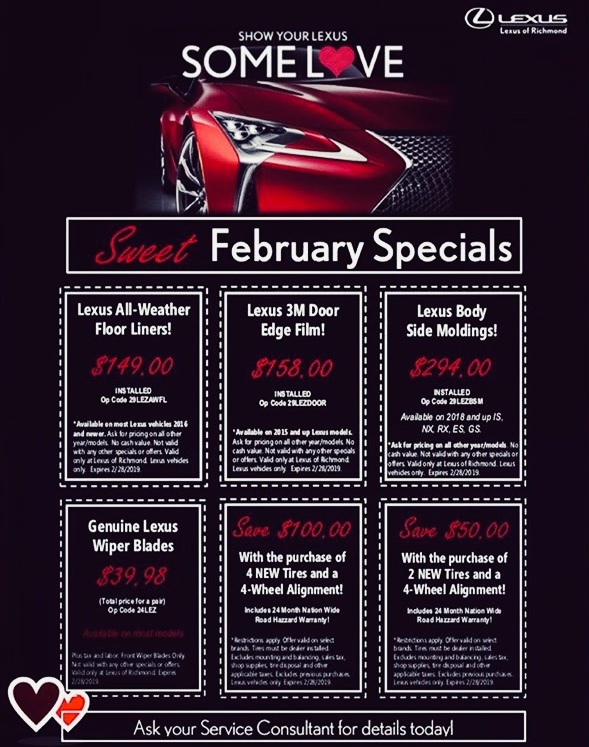 Lexus of Richmond’s January 2019 Service Specials! 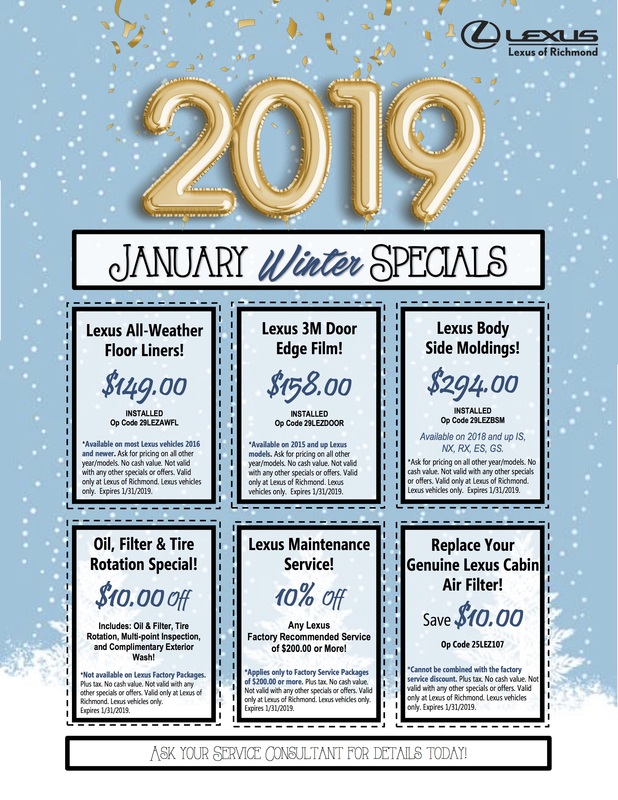 *These prices are valid through January 31, 2019. 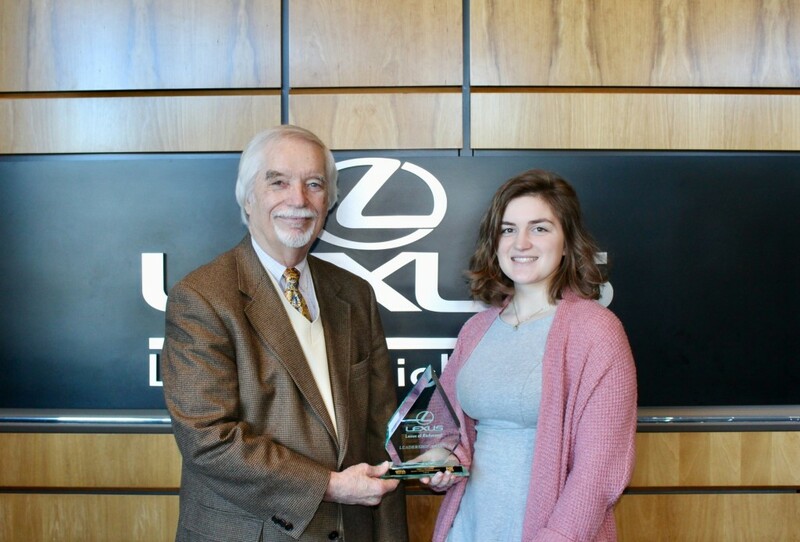 Lexus of Richmond’s week 12 nominee for the Leadership Award Scholarship is Lauren Murphy of Mills E. Godwin High School. Currently with a 4.17 GPA, Lauren is a member of the National Honor Society. She is additionally a member of the Math Honor Society, Spanish Honor Society, and the English Honor Society. Lauren is a member of both the National Beta Club and the National Society of High School Scholars. While attending Godwin, Lauren has been involved in multiple organizations within the student body. She is a member of the Spanish Club and the Fellowship of Christian Athletes. She is also a Keynotes officer in the Key Club. Through the SOHO Club and SODA Club, Lauren helps in local elementary schools. This includes assisting the teachers with projects, paperwork, or maybe even teaching the students a small lesson in class. As a four year player on Godwin’s varsity softball team, Lauren has received numerous accolades and achievements. In 2017 she was chosen as the team MVP, and in both 2016 and 2018 she was the Offensive Player of the Year. As a junior she was named to the First Team All Conference, First Team All Region, and First Team All State. In 2016 Lauren was chosen for the Second Team All Conference. Lauren is even a three time member of the All-Academic Team. After graduating from Godwin, Lauren will continue her softball career at Princeton. During her high school years, Lauren has given back to numerous causes. Lauren has been a peer tutor in Algebra 1 and Geometry to fellow Godwin students. She volunteers with the school’s SOHO Club. Lauren has spent her time outside of school volunteering for Caritas in Richmond. She has participated with Reedville Fisherman’s Museum Oyster Roast. Lauren has also volunteered for the Down Syndrome Association of Greater Richmond for their Annual Slow Pitch Softball Tournament. Lauren has won a dinner for two and is now in the running for the $10,000 scholarship. 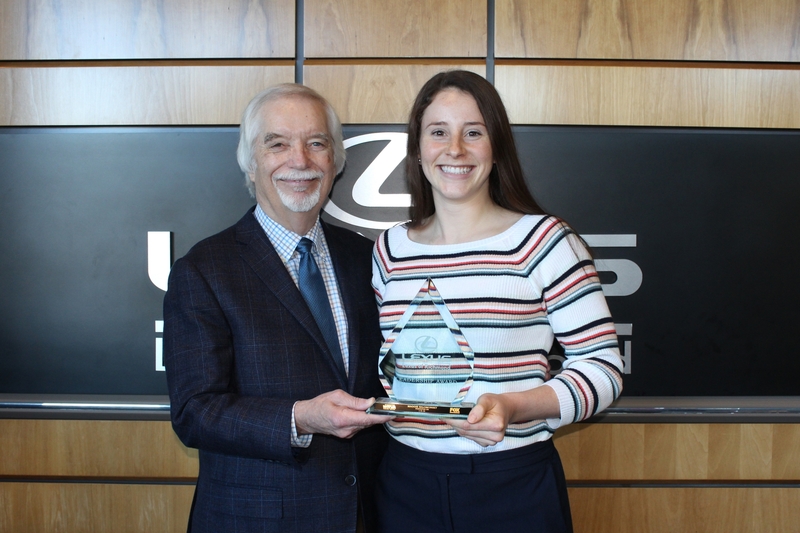 Watch the Fox Richmond – WRLH interview and the Lexus of Richmond Leadership Award interview to learn more about Lauren! Remember to check Facebook for more information about each weekly nominee throughout the school year! Lexus of Richmond’s 11th nominee for the Leadership Award Scholarship is Sam Moore of St. Christopher’s School. Having been on high honor roll every semester of high school, Sam has a current 4.6 GPA. He is an AP Scholar with Distinction, and Sam scored a 1530 out of 1600 on the SAT Exam. Sam is a member of the English 10; a group selected by St. Chris’ English faculty. This group of 10 students are chosen based on their Language PSAT scores, and Sam has been a member for all 3 possible years. During his junior year, Sam received the Dartmouth Book Award from the school faculty, and he was chosen as a National Merit Commended Scholar. Outside of the classroom, Sam is a member of the Saints Chamber Orchestra. Following a successful audition as a freshman, he is now a four year member; as a senior, Sam is 2nd Chair violin. He is a member of the chess club and a peer advisor to the younger students attending St. Chris’ high school. Sam is a four year member of Global Ambassadors and currently the Co-President. The club is dedicated to promoting awareness for the exchange students within the school, and helping them adjust to their new school community. As a five year player for the Richmond United Academy, Sam is a 4 time captain. He plays as a defensive midfielder and center back. During his time with the team he has been called into 7 US Soccer Training Centers. Sam was one of 24 players nationally selected to train at Ajax in Amsterdam, one of the top youth academies in the world. Sam has been a part of St. Christopher’s Futsal team all four years of high school. In 2018 Sam finished the season as the second leading goal scorer for the team. The team was the Valentine Classic Champions in 2017 with 31 goals scored. Sam competed in the US Futsal Nationals while in 8th grade. He was the leading goal scorer with 7 goals in 4 games. Recently, Sam committed to UNC Chapel Hill where he will continue his soccer career. Since his sophomore year Sam has been participating in Saturday Academy. Through this program at St. Chris he and his peers are able to tutor and mentor local underprivileged children. Over the summers of 2017 and 2018 Sam was a teacher’s assistant at the Peter Paul Development Center. For two weeks of summer 2017, Sam participated in Diverbo Pueblo Ingles in Spain. He helped teach English to local Spanish speakers. As a senior Sam is the Vice President of the Building a Better Richmond Public Schools program. The group helps in various schools through the system to clean/maintain and raise funds of improvement. Sam has won a dinner for two and is now in the running for the $10,000 scholarship. 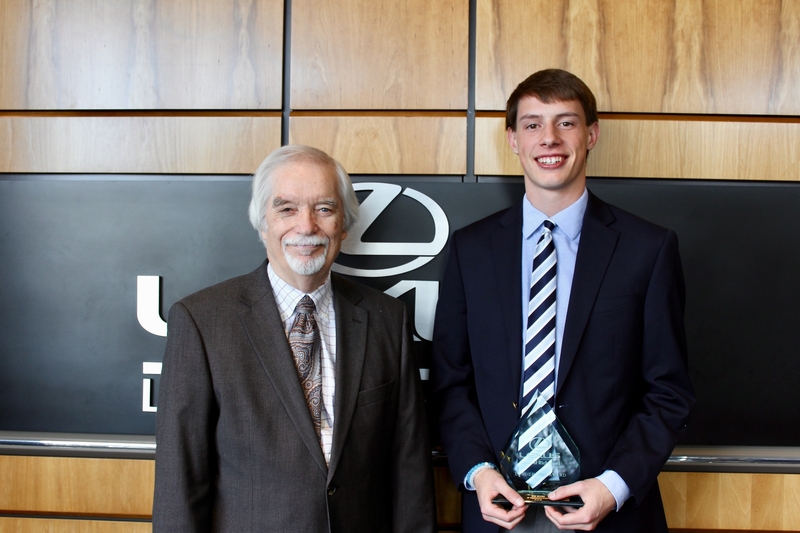 Watch the Fox Richmond – WRLH interview and the Lexus of Richmond Leadership Award interview to learn more about Sam! Remember to check Facebook for more information about each weekly nominee throughout the school year!